Posted in: Art, Music, Photography. Tagged: and glass, Carousel, Michael Parks, Nelson-Atkins Museum of Art, Outside row standing horse Woodcarver: Daniel Müller (1872 - 1952) Manufacturer: D.C. Müller & Bro. 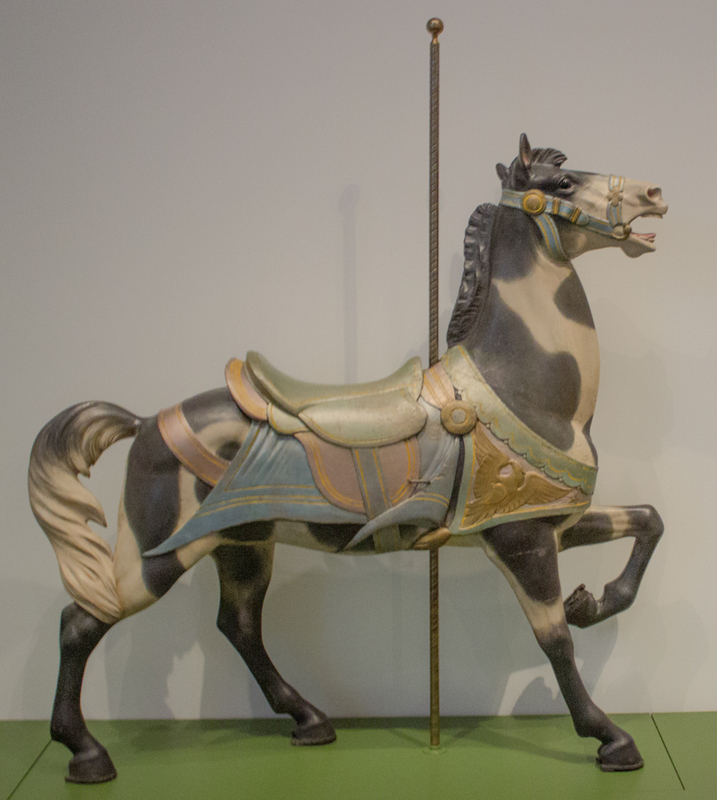 (1903 - 1914) Manufacturer: Dentzel Company (1867 - 1928) Basswood, paint, Ride em cowboy. Description:  The sculpture depicts a standing horse, white with large black markings covering its body, with its proper left leg raised, and its nose lifted to be parallel with the ground, and its mouth open. The horse’s tail touches its proper right rear leg. It wears a bridle and a saddle blanket that are light blue with gold trim. The saddle itself is green and pink with similar gold trim. There is a carved fabric piece draped across its shoulders with an eagle decoration on the horse’s proper right side. The sculpture has large, black glass eyes. Beneath the saddle on both sides are rectangular iron eyelets. This beautiful work of art is perfect in detail. I can only imagine the hours ( and love ) that went into this. They really do a marvelous job with all the details.